The whole textile sector has witnessed a strong performance in last 1 year and the last quarter numbers were exceptional. Yet most of the stocks are languishing and available at low PE multiples. Yes, it could be a value trap if the textile cycle turns towards bad but there are several long term positives going on for the sector and the medium term looks bright, for eg: Appreciation of Yuan is making Indian Textile much more competitive than before. 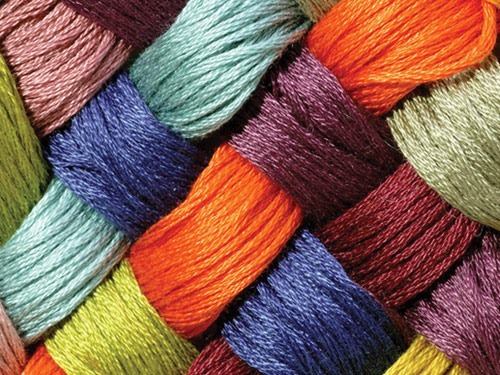 Continue reading Textile Stocks offering value? Posted on April 21, 2011 Author ayushCategories Stocks, UpdateTags nitin, recommendations, salona, Textile, Welspun Syntex32 Comments on Textile Stocks offering value? Camphor & Allied Products is a pioneer in the field of Terpene Chemistry with technology from Dupont, USA. The products of the company are Synthetic Camphor, Terpineols, Pine Oils and Resins etc & they find application in Fragrance, Pharmaceutical, Soap & Cosmetics & Varnishes Industries. CAPL has two plants – first at Bareilly, UP & second at Baroda, Gujarat. CAPL also has a dedicated in-house Research Center. CAPL has been witnessing major change in the performance and profitability since the change in the management in 2008. 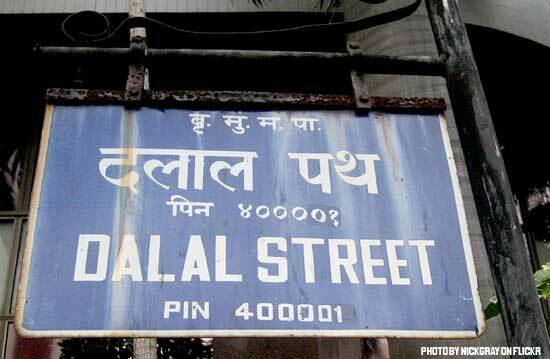 The company was taken over in 2008, via stake purchase and open offer @ Rs 167/share. The new promoters are leaders in fragrance industry – Oriental Aromatics Ltd. Since then the turnover has increased from 105 Cr to 165 Cr and NP from 0.49 Cr to 10.18 Cr, yet the stock is available at Rs 100 only. 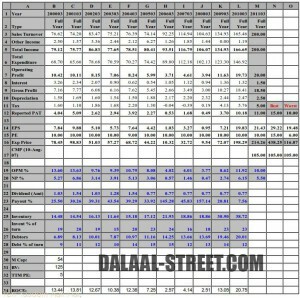 At CMP of 101, the M Cap is just 51 Cr. Operating profit is close to 20 Cr. Another compelling factor is the discount to the open offer price at which the company was taken over earlier. Looking at the quick turnaround, much better revamped websites, strong tax pay-outs, the new promoters seem to be quite capable & honest. If the company continues the good performance, the stock should be prove to be an excellent long term investment and wealth creator. 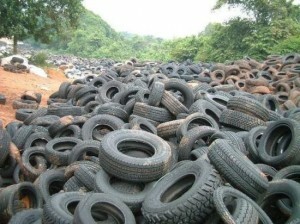 Rubber recycling looks like a good business – as it is both profitable and eco-friendly. Given the rising prices and supply limitation of natural rubber, usage of reclaimed rubber is more economical (costs Rs 40/Kg) and bound to increase. Add to it the opportunity to expand this business. There was an article which highlights the opportunity for this sector – thanks to addition of almost 33 million vehicles in last 3 years in India. GRRPL has established a nice for itself and has become the largest reclaim rubber manufacturer in Asia. GRRPL is one of the most organised and technologically advanced company in this sector. The company has been manufacturing one of the widest range of reclaimed rubber with highest quality parameters and exporting almost 60% of its production. GRRPL has the technical expertise to offer machinery and technical know how to manufacture reclaimed rubber. First to implement customised SAP in the industry. Co has maintained high ROCE – almost 40%. Co enjoys healthy operating margins of 18-22%. Co has good control over inventory, debtors and debts. Promoters seem to be honest, educated and highly capable people who have a strong value system and are there to create value in long run. The company has a tiny equity of just 1.33 Cr. Till 3 months back, the stock was traded in “Z” group and in lot of 50 hence many investors didn’t had access to buy the stock even though they liked this company. Now the stock is in B group. At CMP of close to 875, the company trades at 8 times FY2010E earnings and 4 times EBITDA margins. The company is in process of expanding its capacity and should create new records in terms of turnover, profitability and market-share. One may do well by accumulating the stock on declines with 2-3 yr perspective. The company is a subsidiary of Andhra Sugars (55.02% stake) and is listed only on NSE. The company specializes in manufacturing of Stearic Acid Flakes, Fatty Acids, Toilet Soap, Soap Noodles and Refined Glycerine. The company has been doing contract manufacturing of toilet soaps for leading FMCG brands such as – HUL ( Liril, Lifeboy etc), ITC (Vivel, Superia etc), Marico ( Manjal, Jasmine etc), Johnson & Johnson (Savlon) etc. 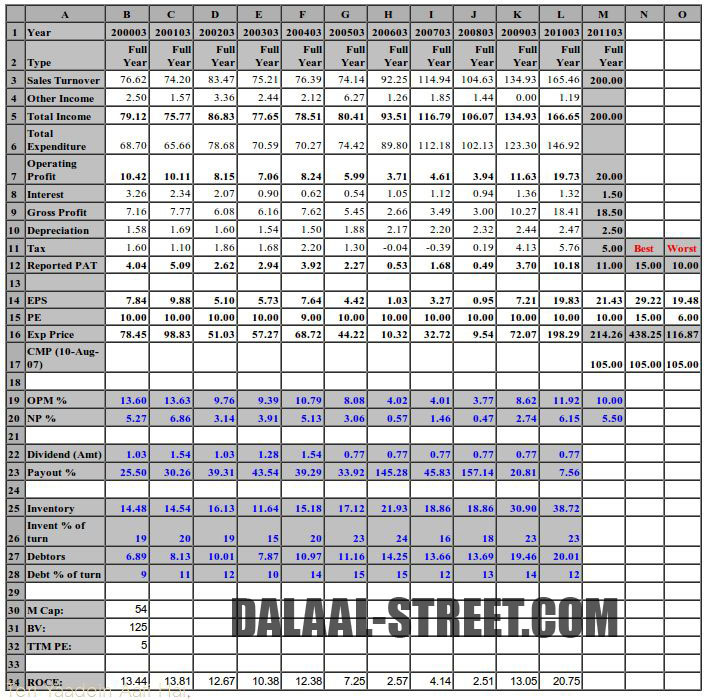 Jocil has been growing at a CAGR of 51% for last 3 years and a CAGR of 25% for last 5 years, yet it is available at a P/BV ratio of just 1.25, TTM PE of just 6. Has limited investment in inventory and debtors. Hence the business is not working capital intensive. So at CMP of 265, we are getting an FMCG related company at a M Cap of about 115 Cr having atleast 25 Cr as cash on Balance Sheet, turnover of approx 300 Cr, Operating profit of approx 35 Cr and a Net Profit of 21 Cr. Isn’t it a value pick? Poly Medicure is one of our favourite small cap stock which has carved out a niche for itself and has grown well over the last few years. 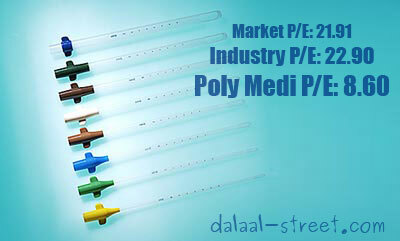 The company is the one of the biggest exporter of IV Safety Cannulae and other healthcare disposable products. This business segment is always growing and with development of better medical facilities, this segment should grow faster. The company is expected to grow at 20% YOY (Year on year) for next 2-3 years. 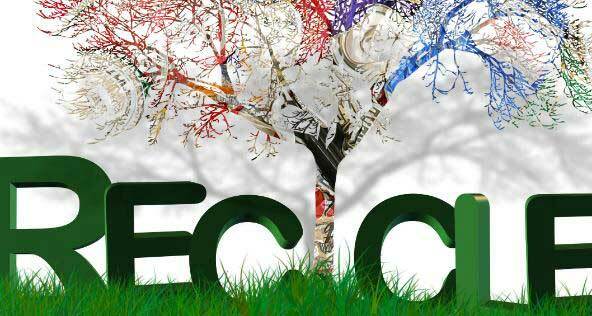 This year the company is expected to do a turnover of 135 Cr with a net profit of 15 Cr, thus implying an EPS of 27. 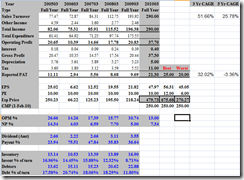 The CMP of 200 discounts the immediate EPS of 27 by just 7.5 times. The last two quarters have been very good due to the backward integration efforts of the company done in the last few years and hence the company may be able to sustain operating margins around 20%. The company has won series of patent infringement cases against major B Braun, after which the company is free to sell the advanced IV Safety Cannulae with the inbuild safety feature (http://www.expresshealthcare.in/201002/market26.shtml). This product has potential to sell at a very remunerative price in the developed nations. The company has been strengthening its sales network on the domestic front and tying up with major hospitals. The company is looking to expand its capacities and targets to double turnover in next 3 years. For they same they are also looking to put up a new factory. Being a high volume low price product, the scaling up of the business is not easy. The company has been trying to develop new products to overcome the same. Here is a company with strong financials, good business model, high margins, good return on equity, good cash flow yet available at less than 8 PE. 1. 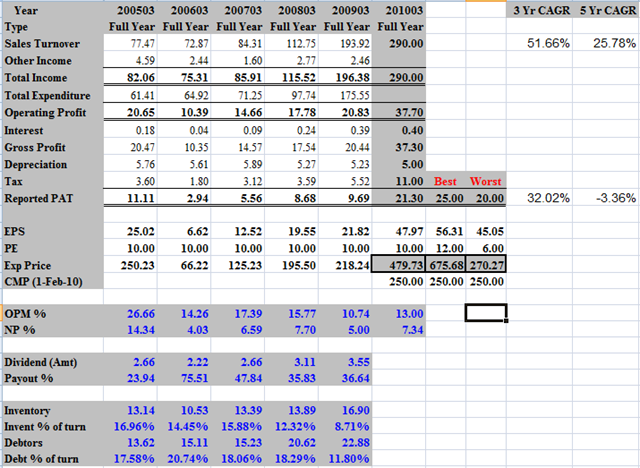 Growing at 30.47% CAGR for last 11 years!!! Yes, the company had a turnover of just 98 Cr in 1999 and last year, the company was able to post a turnover of 1407 Cr. 2. 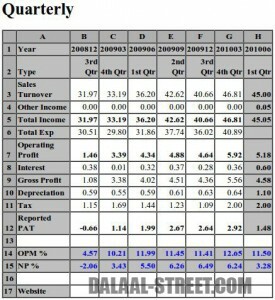 Net profits have also grown at the same pace. 3. ROCE has on average remained in the range of 20-25% for last 5 years. 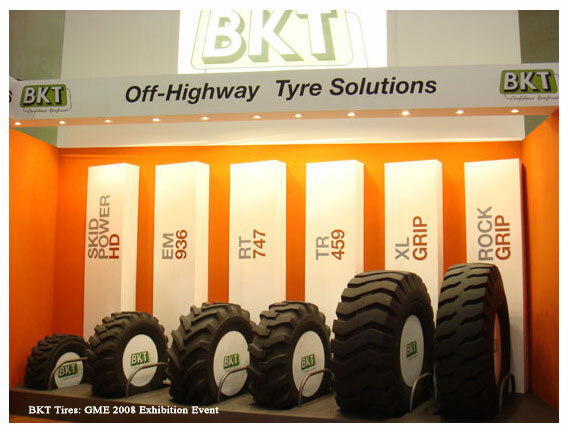 BKT operates in the OHT (Off Highway tyres) segment i.e.. the tyres find application in the agricultural and construction equipment segments. 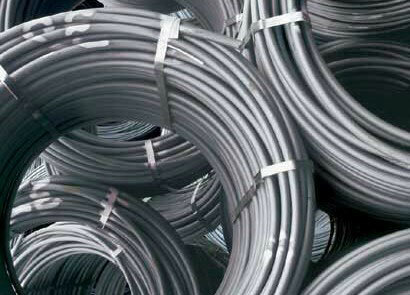 BKT exports 90% of its production to developed countries and 75% of the sales are to the replacement market. Globally this industry is leaded by Bridgestone, Good year and Michelin…and as this business involves high customisation and labour, these global companies are unable to maintain their competitiveness. BKT has been able to provide the quality at 30% cheaper prices and hence is gradually gaining market share. As of now, BKT has a market share of 2-3% and the company aims to increase the market share to double digits in next 5 years. 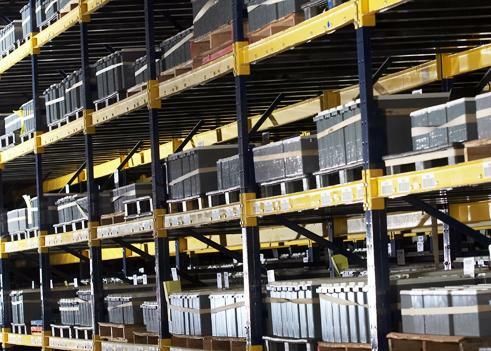 The company has 1900 SKUs – one of the highest in the industry and the company claims to have an expertise in developing the new SKUs in-house in the least time. During the crisis last year, BKT prudently held back the planned expansions to better the balance sheet. 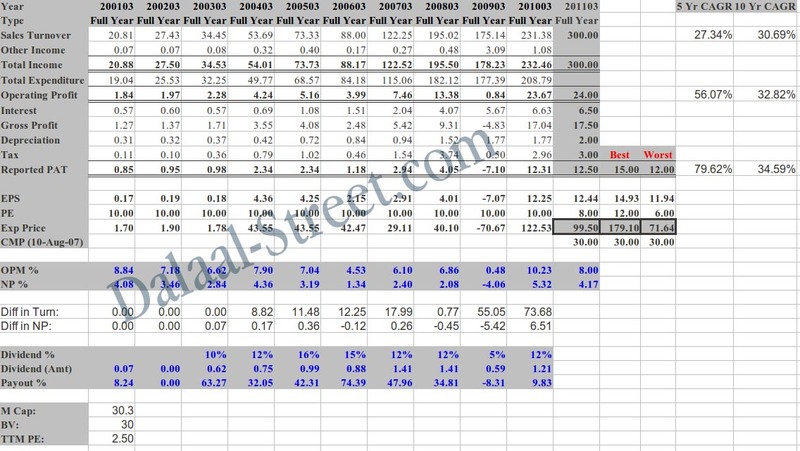 Result – the interest cost has reduced majorly and so has the debt equity ratio. The cash flows are coming in. Going ahead, I feel the company will be back on growth to gain market share. 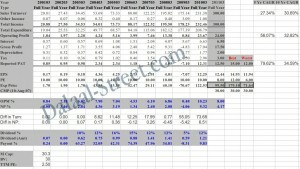 At CMP of 590 and declines, the company is available at attractive valuations for a long term investment perspective.